Yankee Trader Liquidation Auction, Wellington, Colo., (970) 568-9828. Newton Estate Auction, Scottsbluff, Neb., (308) 436-4056 or http://www.HelbergNussAuction.com. 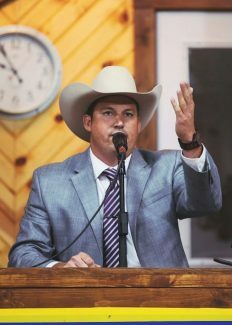 Cross Arrows Ranch & 4Js Farms Complete Liquidation Auction, Lingle, Wyo., (307) 532-4976, (307) 534-5156 or http://www.McnameeBrothersAuctions.com. Farm Power & Equipment Liquidation Auction, Yuma, Colo., (970) 848-2561, (970) 848-2507. IK Ranch Hay Auction, Encampment, Wyo., (307) 703-4020 or http://www.WHBVideoAuctions.com. Landscaping & Tool Auction, Colo. Spgs, Colo., (719) 635-7331 or http://www.HoltAuction.com. Indian Arts & Crafts Auction, Longmont, Colo., (303) 589-4119 or (505) 320-6445 or http://www.PayneAuction.com, NiwotAuction.com. Auction, Niwot, Colo., (303) 652-6924 or http://www.ElysianFieldsAuction.com. Online Equipment Auction, (970) 215-3440 or http://www.JEAuctioneers.com. Stasser Estate Land Auction, Goodland, Kan., (800) 247-7863 or http://www.FarmAndRanchRealty.com. Keith County Pasture Land Auction, Ogallala, Neb., (970) 522-7770, (800) 748-2589 or http://www.ReckAgri.com. Briggsdale FFA Member Auction, Briggsdale, Colo., (970) 656-3463..
Stotz & Greenline Farm Equipment Auction, Tremonton, Utah, (208) 431-3405, (208) 431-9300 or http://www.US-Auctioneers.com. Vehicle & Equipment Auction, Denver, colo., (866) 515-1668 or http://www.RollerAuction.com. Online Equipment Auction, (800) 937-3558 or StockRA.com. Meyer Estate Dryland Auction, Goodland, Kan., (970) 522-7770, (800) 748-2589 or http://www.ReckAgri.com. Fall Equipment & Hay Auction, Burns, Wyo., (307) 703-4020, (307) 635-1995 or http://www.WHBVideoAuctions.com. Callen Farm Auction, Wellington, Colo., (970) 482-6207 or http://www.CLAAuction.com. Sundin Estate Auction, Scottsbluff, Neb., (308) 436-4056 or http://www.HelbergNussAuction.com. Specialty Auto Auction, Loveland, Colo., (800) 901-0022, (970) 266-9561 or http://www.SAAASInc.com. Jehorek Auction, Ogallala, Neb., (970) 474-3693, (970) 520-5257 or http://www.MichaelAuction.com. Herstedt Estate HH & RE Auction, Paxton, Neb., (308) 239-4669, (308) 289-3772 or http://www.SchowAuction.com. Wall Estate Auction, (Rescheduled due to the flood), Loveland, Colo., (303) 589-4119, (970) 215-3440 or http://www.NiwotAuction.com. Griebel Farm RE Auction, Sargent, Neb., (308) 534-9240, (308) 539-4456 or http://www.AgriAffilaites.com. Dawson County Farm RE Auction, Cozad, Neb., (308) 534-9240, (308) 530-6200 or http://www.AgriAffilaites.com.